Last week I had the pleasure of an apprentice! An old friend asked if I could use help and thought her daughter might benefit from seeing how my sewing business works. Well, what a joy it was to have her here! I had a loose structure of three hours per day. I wanted to have her help me with my daily tasks, teach her some sewing skills and inspire her to try new things. The first project was to sew a simple pillow case from my husbands old button-down shirt. That project was for me to keep! 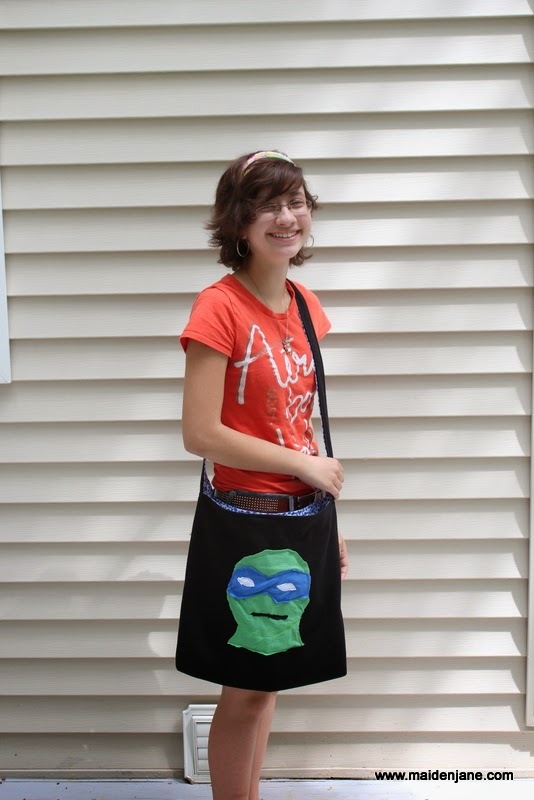 She really loves Teenage Mutant Ninja Turtles, so I had her draw one and we made it into a pattern. 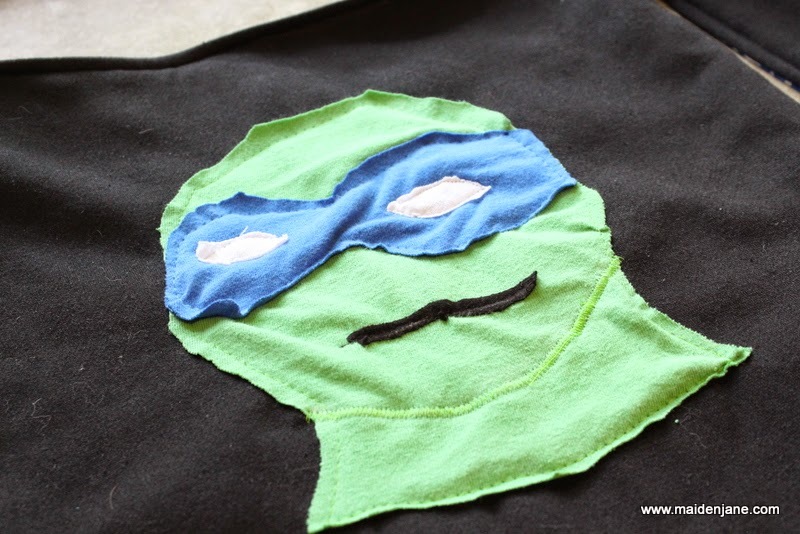 She appliqued the pieces, which were cut from my scrap T shirt fabrics, down onto a piece of scrap sweatshirt fleece. Anything I showed her how to do, she quickly learned and continued to work on independently. 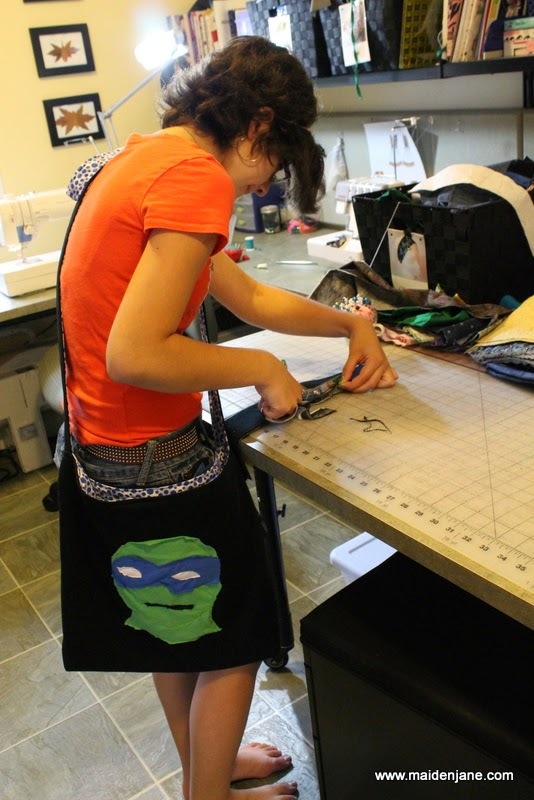 We worked on this lined tote bag together and I am confident she can make one on her own. 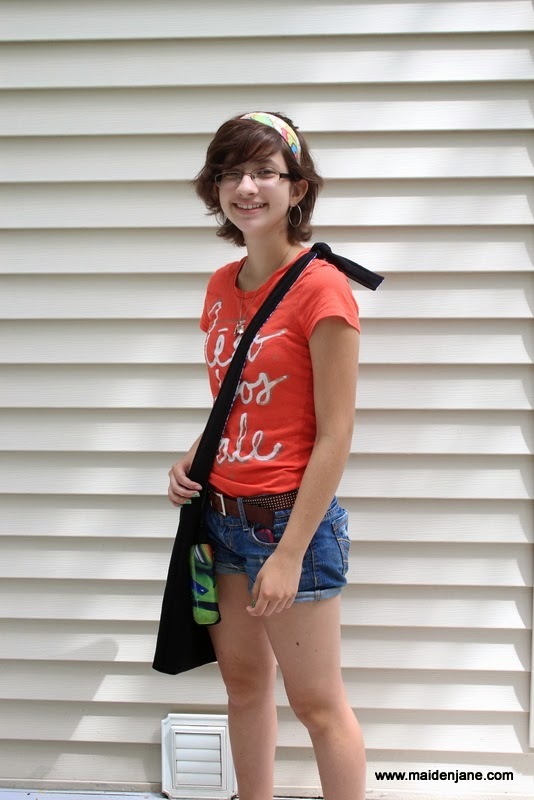 She lives on a farm and hopes to use feed sacks to make tote bags with her 4H group. She learned to insert a magnetic snap. 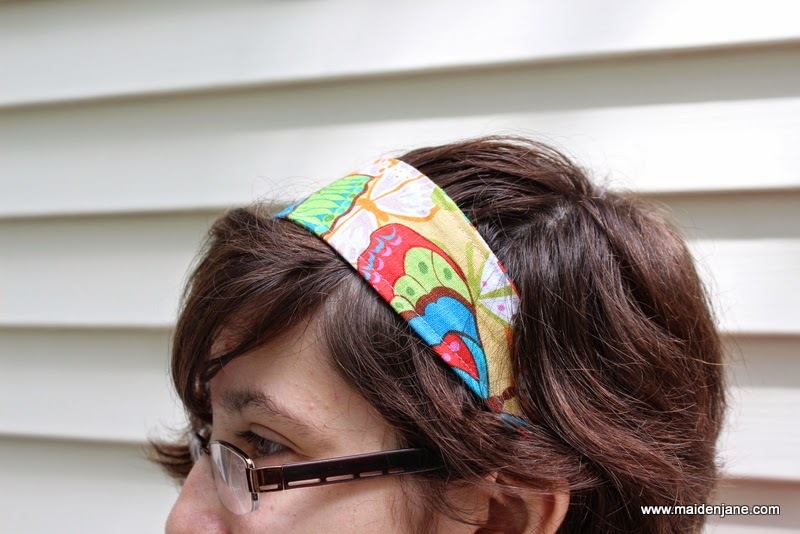 She also made several headbands and did a knockout job. Not to mention she looked adorable in this fabric! On the business side of things, she helped me sew, press, photograph and package. On her last day, she sorted my scrap fabric closet, mainly by fabric type. What a help that was to finally clean and organize the mess. She went home with two bags of fabrics and I had more space! 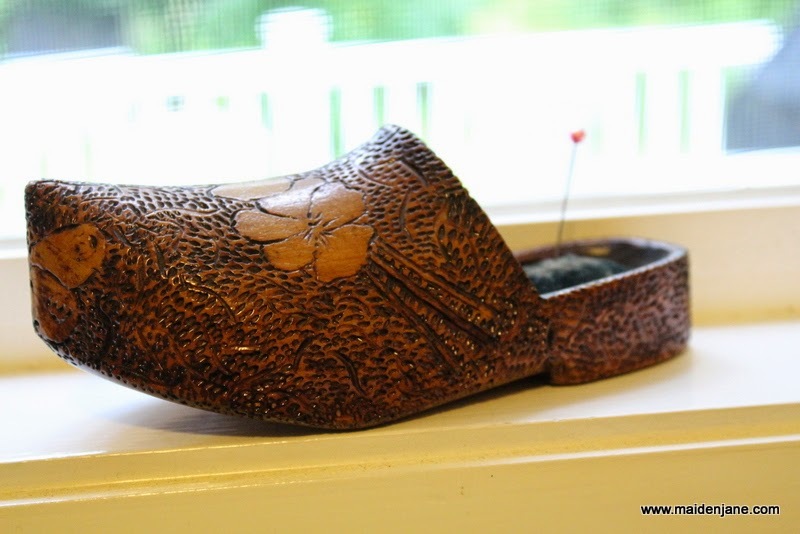 She and mom gave me lovely cards, a gift certificate and this adorable antique, wooden shoe pin cushion! I had a wonderful time with my apprentice. 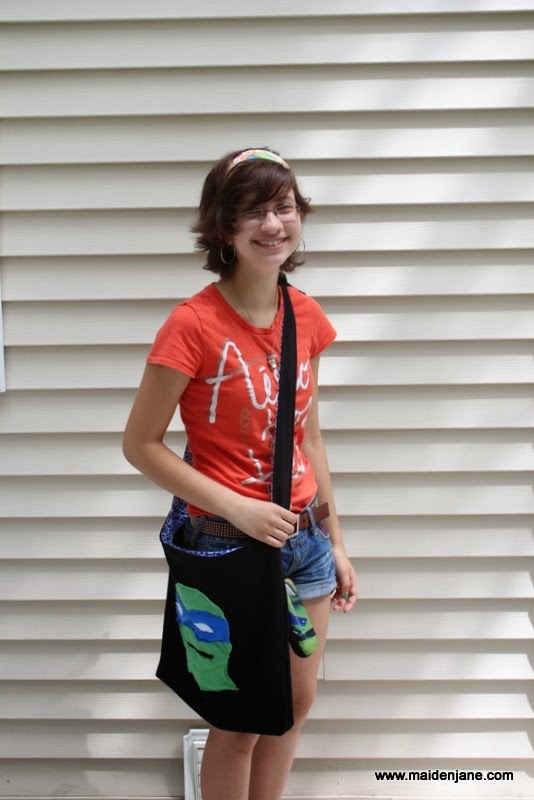 It is my hope that I taught her a few things and inspired her to explore her amazing creativity to make new things. It does make me long to teach sewing. I have done it on occasion, but it is challenging to do in my home studio. Someday…. I’d love to be your apprentice! I thoroughly enjoy reading your blog and being inspired by your creativity. 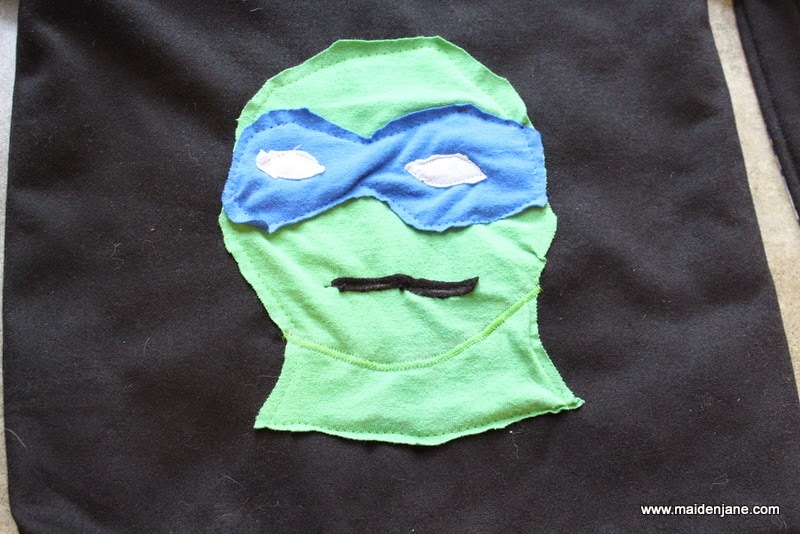 Like you, I enjoy repurposing clothing – especially t-shirts. Usually I repourpose them into nice, soft baby bibs and taggie toys. 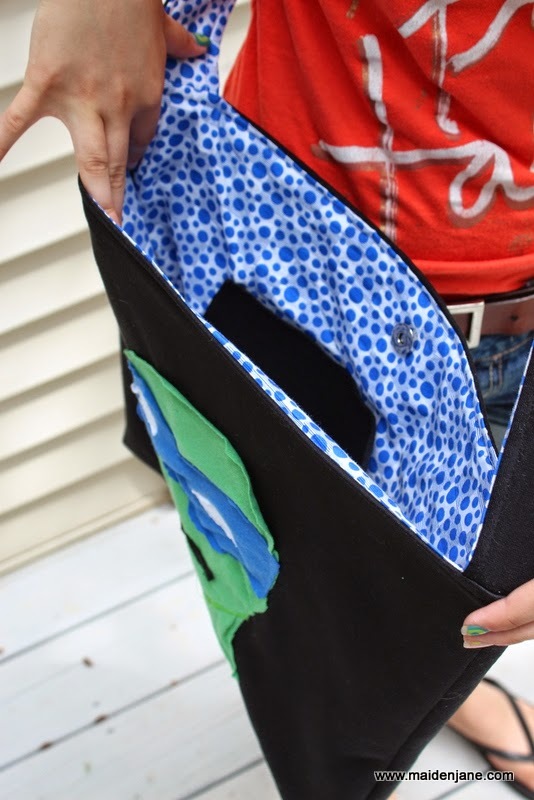 Now that my children have begun to leave the nest, I have more time to devote to sewing which I am really enjoying. Thanks for sharing your talents with the rest of us. OMG.. 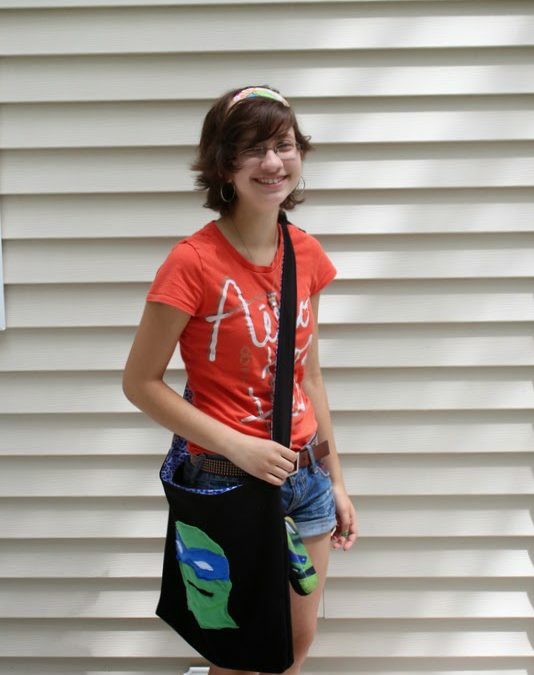 The Teenage Mutant Ninja Turtles bag is awesome. Love that you have such a handy apprentice!